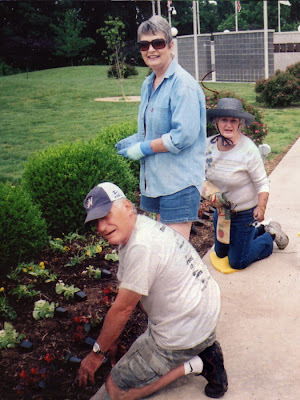 The memorial was created by the Veterans Council of Northwest Arkansas. 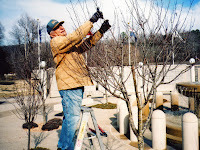 made by so many to create and preserve the freedoms we enjoy today. 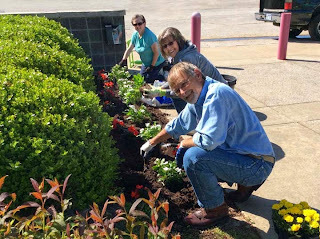 flower beds in front of the memorial. 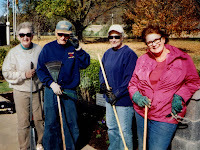 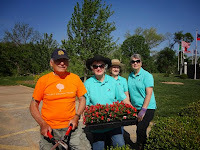 We were honored when both Gene Roy, President of the Veterans Council of Northwest Arkansas and Gary Wellesley, State Commander of the Arkansas VFW, came to meet and thank the Veterans Wall of Honor Committee members and enjoy our Spring Planting (see photo below). 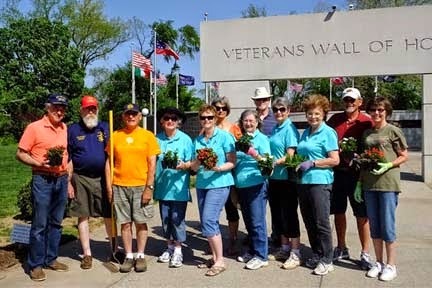 From left, AJ Morris; Gary Wellesley, State Commander of the Arkansas VFW; Toni LiCausi; Marilyn Russell, Co-Chairman of the Veterans Wall of Honor Committee; Kate Pilarski, Club President; Cathy Downard; Helen Bickford; Gene Roy, President of the Veterans Council of Northwest Arkansas; Mary O'Brien; Cathie Whittenberger, Co-Chair of Veterans Wall of Honor Committee; Bill Hodges; and Cheryl Hodges.